A dramatic video has captured the terrifying moment a huge wave swept away a tourist posing on a cliff. 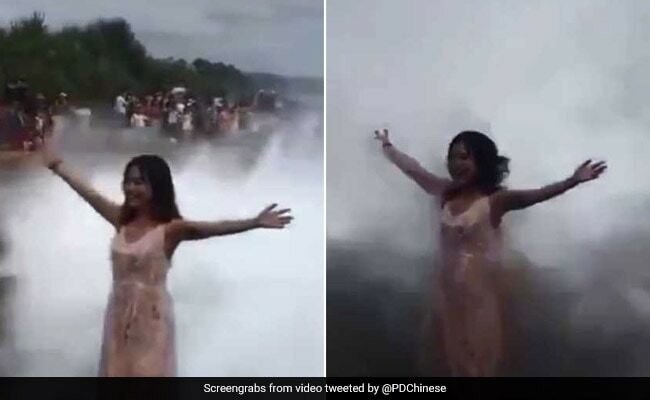 Footage currently going viral online shows a woman posing at Devil's Tear on the Indonesian island of Nusa Lembongan, reports Shanghaiist. As she stands with her arms outstretched, a smile on her face, a giant wave knocks her to the ground. The unnamed woman fortunately survived the ordeal with only minor injuries. A Bali-based Instagram page shared footage of her being carried by a man and receiving medical attention after the accident. Using the incident as a warning, they wrote: "Please like and share this video so more people understand how dangerous it is to stand this close! Please stop and be careful! You still have an amazing view 20m from the edge." Devil's Tear is a popular tourist destination in Indonesia.